(Nanowerk News) Is it a solar cell? Or a rechargeable battery? 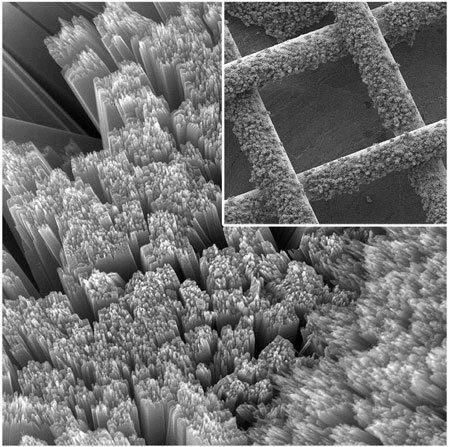 In the October 3, 2014 issue of the journal Nature Communications ("Integrating a redox-coupled dye-sensitized photoelectrode into a lithium–oxygen battery for photoassisted charging"), the researchers report that they’ve succeeded in combining a battery and a solar cell into one hybrid device. In tests, they charged and discharged the battery repeatedly, while doctoral student Lu Ma used X-ray photoelectron spectroscopy to analyze how well the electrode materials survived—an indication of battery life. First they used a ruthenium compound as the red dye, but since the dye was consumed in the light capture, the battery ran out of dye after eight hours of charging and discharging—too short a lifetime. So they turned to a dark red semiconductor that wouldn’t be consumed: hematite, or iron oxide—more commonly called rust.